On the way back from lunch yesterday, I came across this in the old AI Friedman space on Madison Avenue between 33rd and 34th. Just down the block from Tina’s Cuban is a sign for a new place called Nanoosh, a “Mediterranean Hummus Counter.” I’ve never heard of such a thing, so I did a little googling. Apparently it’s a chain with locations on the UWS and UES whose schtick appears to be topping pretty much everything (from salads to wraps to entrees) with hummus, tahini or both. Anybody been to the other two locations? Should we be excited for this? Or is it just another in a long line of trendy, brightly colored, well marketed chains popping up in Midtown these days? According to their website they’ll be open in May. Zaro’s Bakery to Become French Pasta Chain? Posted by ultraclay at 2:30 pm, April 29th, 2010 under *Mad btw. 33+34th, Middle Eastern, Nanoosh. one opened up about 6 months ago next door to my aparment…havent been though..yeah, any good people? My wife and I used to live accross the street from the one on UWS. We loved it. Bit on the pricey side in my opinion but very good. I’ve been to the one up near Lincoln Center and I think it’s delicious. I can’t speak to its authenticity, and I do think Hummus Place has better hummus overall; but I’m glad to see the chain is doing well. Hummus is yummus. 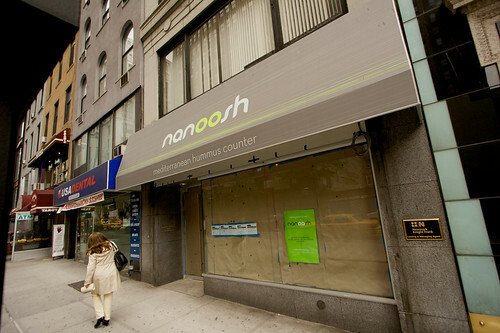 Nanoosh is my favorite quick pre-show food place on the UWS! i go to the one on 1st ave bet 68th and 69th occasionally for lunch. solid food. a tad on the pricier side… but tastes great! I went to the east side location last week and had a great hummus and egg wrap. The wrap itself was great. Didn’t try the pita, but it looked really good and the place was packed even though we got there around 2pm.